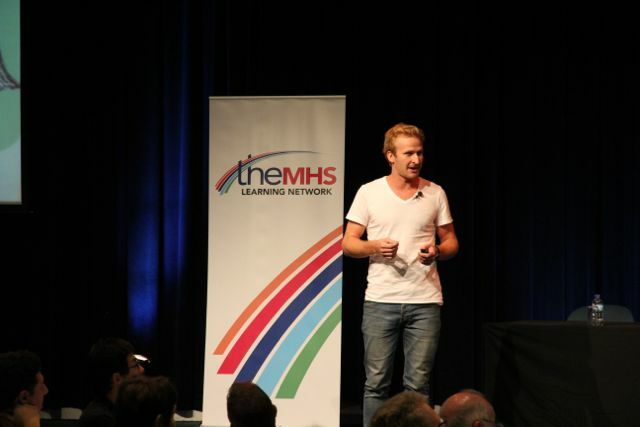 SF 15 Session 2b - Sebastian Robertson: Why we should leave the toilet seat up - TheMHS Learning Network Inc.
Sebastian Roberston is the founder of Batyr, a social enterprise that focuses on preventative education in the area of young people’s mental health. Batyr provides programs that train young people to speak about their personal experience with mental ill health and start a conversation in their community. Sharing his own story about struggling with mental ill health, Sebastian emphasised the importance of using personal experience and face-to-face interaction to start the needed conversation about mental health amongst young people. It is this concept of other young people sharing their stories of mental health struggle and recovery that form the basis for “Batyr”. As young people are greatly influenced by their peers, the Batyr organisation locates and trains young people who have personal experience with mental ill-health to share their journey with young audiences. In this way they aim to encourage empathy rather than simply sympathy and ultimately provide support and guidance for auidences to seek help if needed. In a very promising statistic, Sebastian stated that of the thousands of young people they surveyed who had participated in their programs, 71% said that they would seek help for mental ill health if needed after hearing the speaker talk about their story. Engaging and sustaining engagement is one of the greater challenges when creating awareness of mental health amongst young people. Batyr tackles this by asking for volunteers from the schools at which they present to promote the program to their peers.